Indentification of this design as number 125 is original to Rakusan who designated this woodblock print as the 125th design published in his main sequence. However, 125 is actually the twenty-fifth of thirty-six woodblock prints in Rakusan's second main sequence series, 篁子生画選, Koushisei Gasen, lit. 'Koushisei's Print Selection' (usually called here the 36 Series). The woodblock print of 125 was adapted from an actual-size original painting on silk. All of the original prototype paintings for this series are currently in a single private collection. Like most 36 Series designs 125 has the same signature and seal combination on every copy. However, 125 is one of only a few designs which defines two editions based on the placement of the same signature and seal combination within the image area. The copies illustrated above are typical of their editions, including the Western-style signature added subsequently to the edition II copy. Edition I copies have the signature and seal at lower left, quite close to the lower margin. It is usually only possible to date an individual loose print of 125 with edition I markings by listing approximate potential ranges of 1935-1941. Although for edition II Rakusan chose to retain the same signature and seal combination used in edition I, he raised its position from lower left to upper left. This modification was made primarily in order to accommodate placing Foster's requested cursive romaji signature along the left lower margin (as in the example above). Probably not all edition II copies of 108 have that signature, but most apparently do. Edition II of 125 was a direct result of a Foster commission since there is otherwise no compelling reason for altering the placement of the attribution markings. However, raising it enough to clear much of the vegetation also makes the markings more legible. The rarity of edition II of 125 implies a short production period, and probably only a single print run from somewhere between circa 1950 and the studio closure in 1955. Unfortunately, the white pigment Rakusan used in 125 is subject to chemical alteration. This is most often seen in the falling snow and snow accumulated on the branches. In its mildest form these areas take on a pinkish or rusty orange tinge, but when complete it changes to a leaden gray. There are copies on which the originally white falling snow is entirely gray. Edition I: Harvard Art Museums (Arthur M. Sackler Museum), Cambridge, MA, USA; (1941.55) [illustrated online]. The Rakusan project which produced 篁子生画選, Koushisei Gasen, resulted in two related series of woodblock prints. Each print of the 36 Series is intimately connected to a group of prints with the same subjects in the Fan Series. Together these subject-related prints in the two series constitute a theme. Each theme typically consists of a quintet of monochrome Fan Series designs (one design in each of the five fan shapes), plus one polychrome, 36 Series design which illustrates the theme subject. The theme is labeled here by the original Rakusan number of its 36 Series design followed by the subject. 125 is the 36 Series design of the 125 Pussywillow theme. The 125 Pussywillow theme is one of the many entirely regular themes represented by a complete fan quintet and a color woodblock print. All five Fan Series designs have seal C, which indicates carving dates between the last months of 1933 and the end of the first quarter of 1934. Despite the early completion of those wooden blocks, Rakusan delayed printing and distribution for several months. It was eventually grouped in an installment with other winter season themes nearer to the end of the series. However, the 36 Series design 125 has seal B which indicates a later carving period closer to the time of publication. On the delivery folio for installment eight of the Fan Series in November 1934, Rakusan announced theme 125 as due to appear in installment nine in the following month, December 1934. However, it is not known if installment nine of both series were actually distributed in that month or were delayed. The woodblock prints would have been printed during the same month as their distribution. In the folio announcement Rakusan used the title 猫柳に鴫, nekoyanagi ni shigi, 'pussywillow and shorebird', which is appropriate only to the 36 Series design 125 published at the same time. The only subject common to all of the designs in this theme is the pussywillow. Therefore, a more general title, the 125 Pussywillow theme is used here. Some of these pussywillow designs were adapted from sketches originally created in the late 1920s during the planning of designs 83 and 86 in the earlier 100 Series (see below). .
Twining among the bases of the willow shoots at lower left are the unidentifiable withered remains of a vine or creeper. Exact species identification among the various closely similar snipes is notoriously difficult in the field, and from an artwork it is almost impossible. 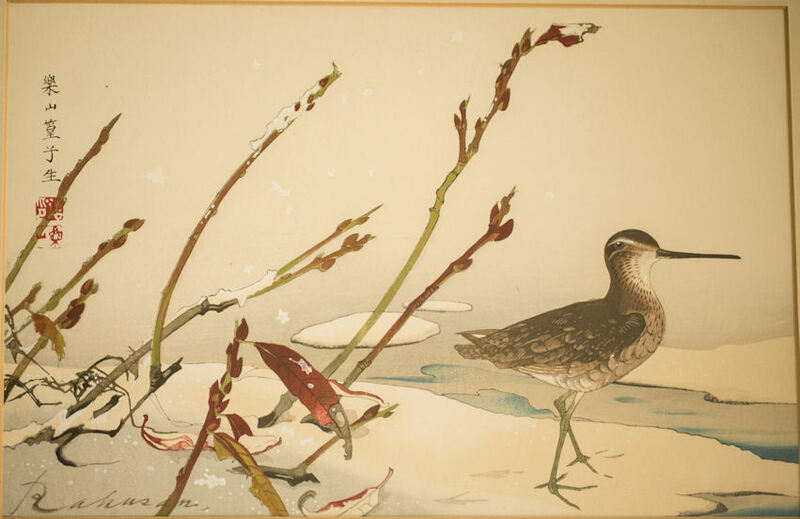 Rakusan included only two snipes in his artworks, one here in 125 in winter plumage and the other in 51 in summer plumage. Even if Rakusan were illustrating the same individual, it would look different because of seasonal plumage variations. In the folio title Rakusan used 鴫 (also written 鷸, しぎ, シギ), shigi. Historically, 鴫 can be translated as 'snipe' as Rakusan intended here, but it is more often today rendered as 'sandpiper'. A better English equivalent is 'shorebird' since the meaning actually includes any bird in the families Scolopacidae or Rostratulidae. It is also unclear whether or not the birds in 125 and 51 are intended to be the same species since the folio title is so general. Rakusan used 田鴫 in the title-caption for 51; indicating Common Snipe (Paddyfield Snipe), Gallinago gallinago, 田鴫, 田鷸, たしぎ, タシギ, ta-shigi, lit. 'field shorebird'. References to modern wildlife photographs suggest that Rakusan created 51 using sketches of a dead snipe rather than from observation of a living one. The positionings of the head, feet, and back feathers are all unnatural ones. Although the pose in 125 is much more lifelike, the plumage is rendered with more artistic license and in less detail than in 51. 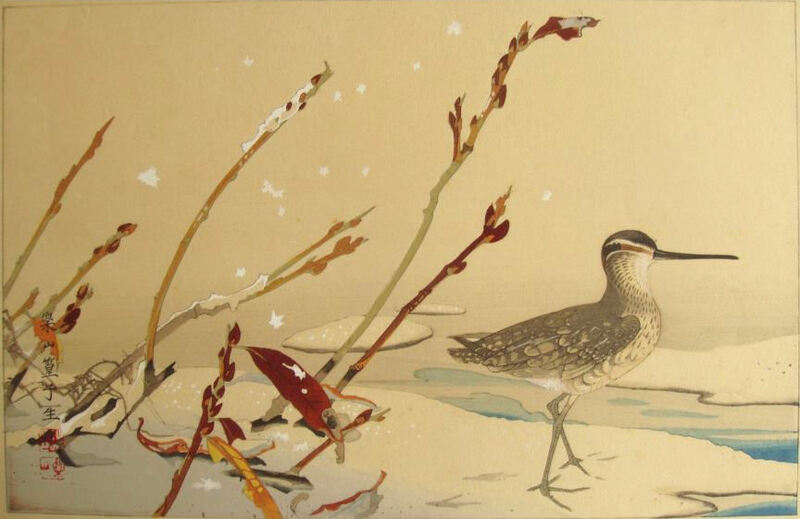 The details Rakusan chooses to enhance in 125 suggest that snipe is a different, slightly larger, species, Japanese Snipe (Latham's Snipe), Gallinago (Capella) hardwickii, 大地鴫, おおじしぎ, オオジシギ, ooji-shigi, lit. 'ground shorebird'.